Helps relieve the symptoms associated with chronic prostatitis /chronic pelvic pain syndrome (CP/CPPS) and improve quality of life. Mandatory - Examination of abdomen, external genitalia, perineum and prostate is mandatory. Not recommended: for routine evaluation. Not recommended in routine practice, unless there is a specific indication. Quercetin is found naturally—for instance, in apples, grapes, green tea, and onions—and has antioxidant and anti-inflammatory properties. Quercetin is found naturally—for instance, in apples, grapes, green tea, and onions—and has antioxidant and anti-inflammatory properties. It is a multi-potent bioflavonoid, with great potential for the prevention and treatment of disease,13 which helps reduce inflammation and maintain the body’s inflammatory responses. Adult Men: Take one tablet 2 times daily, preferably with a meal or as directed by your healthcare practitioner. Use for a minimum of three months to see beneficial effects. Q-UROL® is well tolerated by most people and side effects are rare. 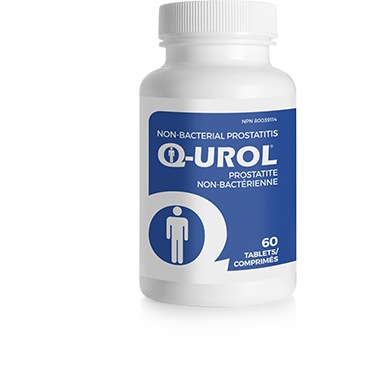 There is a theoretical risk that the use of quercetin may interfere with the action of quinolone antibiotics therefore you should not take these antibiotics with Q-UROL®. Consult your physician for more information. Q. What is chronic prostatitis / chronic pelvic pain syndrome (CP / CPPS)? Chronic prostatitis / chronic pelvic pain syndrome (CP/CPPS) may be caused by a bacterial infection, but in many cases the cause of CP/CPPS is unknown. When CP/CPPS is caused by bacterial infection it can be treated with antibiotics. When the cause is unknown, treatment of the symptoms may be the best course of action. Q. How can Q-UROL® help me? Q. Do I need a prescription from a healthcare practitioner in order to obtain Q-UROL®? Q-UROL® is a non-prescription natural health product approved by Health Canada, and as such does not require a prescription for purchase. Q. What are the ingredients of Q-UROL®? Quercetin is a multi-potent bioflavonoid, with great potential for the prevention and treatment of disease.13 It’s found naturally—for instance, in apples, grapes, green tea, and onions—and has antioxidant and anti-inflammatory properties that help reduce inflammation and maintain the body’s inflammatory responses. Q. How do I take Q-UROL®? For adult men: Take one tablet 2 times daily, preferably with a meal or as directed by your healthcare practitioner. Q. How long do I need to take Q-UROL® before I feel beneficial effects? Take Q-UROL® for a minimum of 3 months to see beneficial effects. Q. Is Q-UROL® well tolerated? Q-UROL® has been shown to be well tolerated by most patients and side effects are rare. Some men have reported mild nausea when taking Q-UROL® on an empty stomach or slight tingling in the extremities shortly after their first dose. Speak to your healthcare practitioner for more information. Q. Is there any trial data to support the use of Q-UROL®? There is a theoretical risk that the use of quercetin may interfere with the action of quinolone antibiotics therefore you should not take these antibiotics with Q-UROL®. Consult your healthcare practitioner for more information. Q. Where is Q-UROL® made? Q-UROL® is made in the USA. Q. Where can I buy Q-UROL® in Canada?